First a note to regular readers: thank you for your prayers and support during my sister's time in critical care and since her death a week ago. It is my hope that I am ready to return to intensive special needs focused blogging on Monday. 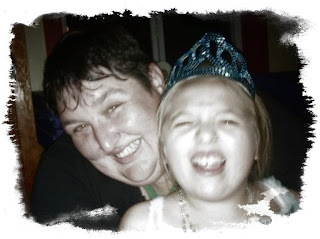 However, in my sister's eulogy there is a message for the special needs community, as Stacey was a brain injury survivor and a disability activist. Also, from my site statistics I know many of Stacey's friends have found this site and I want to share this eulogy with everyone. Thank you all again. At just 29 years old it is hard to believe how many lives Stacey had touched but it is true. No matter who I speak with they seem to tell me of Stacey’s humor, her intelligence, her determination and her generosity. Of course sometimes they call it her attitude and her stubbornness, but they are the same thing. Sometimes Stacey touched lives one at a time and sometimes Stacey touched lives a roomful at a time, but she always made a difference. Many of you remember that Stacey walked everywhere and that she was unafraid to engage in a conversation with anyone she met on the street, whether it was a small child or an elderly homeless man everyone was an equally worthy conversation partner for Stacey and if anyone one needed anything she would hand it over, no questions asked. Recently Stacey stopped and talked to a woman who was pan handling outside a grocery store. The woman said she needed diapers for her baby. Stacey went into the store and purchased diapers and then was chastised by the woman because the diapers weren’t good enough. Stacey didn’t care much because she knew if nothing else the baby had diapers and she got a good story out of it. That was the kind of person Stacey was, she lived on a very tight budget but wouldn’t think twice before buying diapers or anything else for a stranger. Many times Stacey didn’t even know the lives she touched. She did a lot of public speaking both as part of her commitment to sobriety and as an activist in the disability rights movement. Friends of Bill W. from New Hampshire to New York, and perhaps beyond, have been inspired by Stacey’s story of recovery and she would want all of you to know that she passed away clean and sober, in fact almost eight years to the day of her sobriety date. One of my favorite stories, a story I make my father retell often, is of how he overheard one man telling another man about a courageous young woman with blond flowing hair speak at an AA meeting one night and how that young woman had touched him. The young woman was, of course, Stacey. When speaking in the disability rights movement Stacey’s most frequent topic was maximizing potential of people with disabilities. I think it can be safely said that nobody had maximized their own potential like Stacey had following her brain injury. In fact, perhaps the most telling fact about Stacey is that after her brain injury, when the doctors said she would not speak again, her first words were, “thank you”. I’m not sure “thank you” would be my first words if someone else just shaved my legs, but that’s Stacey for you, full of gratitude, even for the little things. Of course her next word was “zipper” and I have no idea how to make that meaningful. Years later Stacey spoke to high school students about disability awareness and to people learning to work with children who have developmental disabilities about potential and independence; giving of herself, even when she was self conscious of her speech disorder which sometimes made her speech sound slurred or as if she had an accent. During her speeches Stacey would talk of her seemingly endless occupational, physical and speech therapy sessions and the potential power of people in lives of individuals with disabilities to never give up and to insist on independence. Stacey had been told she would never walk, talk or use her hands. She ended up doing all three - her message in her speeches was clear and people heard it. As a special needs teacher I could always tell when someone working in my classroom had been to a session Stacey spoke at from a change in his or her approach the very next day. 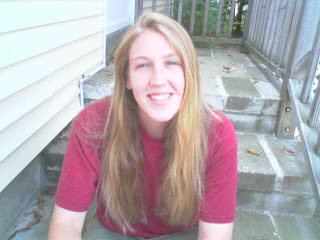 Stacey had that power - to give of herself through her words and make others want to do the same through their actions. Even in her passing on Stacey gave of herself and touched people’s lives. I am sure most of you remember Stacey’s devastation at losing her hair during her brain injury in 2000 and her dedication in growing that long blond hair back. After she lost her hair we would all tell her that it was growing back and she would respond, at first by spelling on her communication board and later, once she learned to speak again, by curtly saying, “not fast enough!” In the months before her death Stacey had been talking about cutting her hair and donating it to Locks of Love. Stacey wanted to help a child whose hair was not going to be growing back “fast enough”. During one of the last meetings our family had with the wonderful staff of the critical care team at Lawrence Hospital in Bronxville, Stacey’s beloved boyfriend Gilbert suggested that we make sure that this wish of Stacey’s happened and we did, Stacey’s hair has been donated to Locks of Love. Stacey was a young woman who experienced a lot of pain and difficulty in her short life, but in spite of that she never stopped caring about others and never stopped touching the lives of everyone around her. Perhaps if each of us here today can take this lesson Stacey gave us, to try to give back or at least to try to give a smile every day we can make the world a less painful place, a place full of the kind of love Stacey shared with us all. 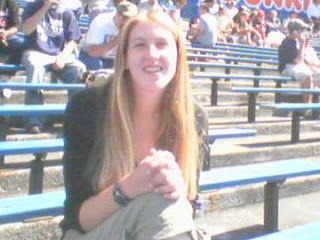 Stacey P. Ahern of Chelmsford, writer and author; 29 CHELMSFORD Stacey P. Ahern, 29, of Chelmsford, died on Thursday, March 20, 2008. She was a beloved sister, daughter, and Godmother. Stacey was born on February 28, 1979, in Lowell, a daughter of Carol Gendron-Ahern of Chelmsford, and Brendan M. Ahern of Lowell. She received her early education in the Chelmsford School System, and went on to attend Chelmsford High School, and graduated from Nashoba Valley Technical High School in 1997. She attended Middlesex Community College prior to attending Sarah Lawrence College in Bronxville, NY where she was a senior studying Writing and Literature. She enjoyed writing and had recently completed her first novel. Stacey was a disability activist* who spoke publicly for maximizing potential for people with disabilities, as well as a member of Beyond Compliance, a disability awareness group at Sarah Lawrence College. She enjoyed helping others, and had recently donated her own hair to the Locks of Love. In addition to her loving parents, she is survived by her grandparents, Albert Gendron and his wife, Priscilla of Lowell; a brother, Brendan Ahern of Hawaii; a sister, Kate Ahern of Haverhill; a godchild, Anthony Torres; her boyfriend, Gilbert Escamilla of Manhattan, NY; her father's dearest friend, Diann Hamblett of Chelmsford; and many cousins, aunts, uncles, and close friends. My beautiful, smart, funny, insightful and courageous sister passed today at 2:30 in the afternoon surrounded by people who loved her beyond words. Her passing was peaceful and gentle and we are all relieved she has no more pain. At the moment life support was removed the hospital played the music that means that a baby is born, and then they played it again - twins! None of our family had said it aloud but we had all been hoping that would happen, the circle of life continuing in such an obvious way and it would take two babies to fit the personality of our sister. Our brother had the idea to buy a card for the family of the new babies and he composed a beautiful letter, which I edited and we all signed explaining that they did not know us but our sister/daughter was removed from life support at the moment of their daughters' birth, we had been hoping to hear the music play and that we wished them a life time of happiness with their daughters. For those who asked in e-mail: services are as follows: visiting hours 4-8 PM Tuesday, March 25, Blake Funeral Home, Chelmsford, MA and funeral mass, St. Mary's Church, March 26th 9 AM. I am sorry that there will be no new blog entries indefinitely because of a family crisis. I feel a bit uncomfortable asking, but, if you are the praying sort, could you pray for my sister? She has been in a coma, on a ventilator, since Monday and is now in multiple organ failure. That is her to the left. It would mean a lot to me. In follow up to the last post and in response to a question from a reader here is a list of well known AAC devices which have built in (as opposed to add on) environmental control in the form of the ability to act as an infrared remote control. Look in your users or training manual and/or on the knowledge base on the vendor's website to learn how to program your device to act as an IR (or x10) remote for a tv, dvd player, mp3 player, remote controlled toys or even the garage door. Attention: If I missed a device with built in (not ADD ON), "learning" IR please comment and I will add it. In a variety of ways the past week or so I have been reminded that nothing can replace a teacher who is well-educated, well-prepared and willing to learn and research more to be a better teacher. First there has been a discussion among some people I correspond with about how to teach reading. Within the conversations there were so many myths floating around that my head was swimming. First there was the idea that all it takes to teach any aspect of reading (or anything else) is a "curriculum". Curriculum in this conversation meant an off the shelf book, series of books or software. Thus teachers were speaking as if they could suddenly teach reading if only they had this or that "curriculum". There was little knowledge behind what some people were saying. Nothing indicated that people understood what research says actually works to teach students to read. Maybe I was privileged to have attended the college I attended to prepare to be a teacher, I know I was privileged to have had the professor I had for reading methodology (thanks Donna), but I don't understand how teachers can be in the classroom everyday and NOT know what scientific research says about how to teach students to read. Science is actually pretty clear on the issue and has been for many years. The problem is that many teaches did not learn how to read themselves using science based techniques, many teachers never studied science based reading research in college and many teachers think that phonemics, phonics, fluency, vocabulary and comprehension are boring to teach. Yet that is exactly what science based reading research says we need to teach - phonemics, phonics, fluency, vocabulary and comprehension. Not "whole language", not "balanced literacy", not "four blocks", we need to use programs created using science based reading research. There is a great article on Ed Excellence that explains all of this (and why those programs are NOT based on science). As this reading debacle has been going on with around me I have also meet with or heard from many learners or families of learners who do not have access to appropriate assistive technology or alternative/augmentative communication. Someone I know questioned me today about why a student would get to high school and not have a speech generating device if she needs one. Although the reasons behind that may initially look like funding issues or some other reason, the true reason is someone wasn't the well-educated, well-prepared and knowledgeable teacher they needed to be. 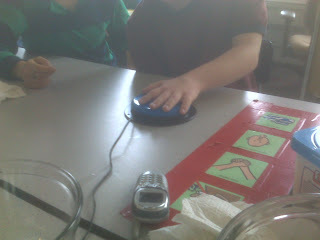 Some teacher didn't push and press and prove that the student needed AAC and didn't find a way to make it happen. I'm not saying that all teachers need to be AT or AAC experts (or step on the toes of people who are experts), I am saying that all teachers need to know what is out there, how to get it funded and who is supposed to be doing the work within their school, district or agency to make it happen. Maybe some of us didn't take the assistive technology or AAC course in college (if there was one), it doesn't matter, we still have the responsibility to learn about it now. Teachers are the team leaders; we are the one thing that schools can't cut (after all speech, OT and PT can be dropped from IEPS, but not having a teacher) and we need to know what our students need and how to get it for them. There is no reason, in this day and age, when children in developing nations are getting lap tops, for our special needs students not to at the very least have someone fighting for them to have what they need in terms of tech, AAC or anything else, but first we need to know what we are talking about. We need to be knowledgeable. We teachers in the field of multiple special needs have a unique role. A role that very few other educators have. We have even more power to make a difference in our students lives than many other kinds of teachers. I think that is why many of us choose this field, yet when we don't do everything we can to be as knowledgeable as possible we don't make a difference; we end up babysitting. P.S. I have a feeling this may be my first truly controversial post in nearly two years of writing this blog. Do try to keep the comments civil and productive. Thanks to Paul Hamilton at Free Resources from the net I want to point you to two blogs that offer links to more free things online for educators. One of my favorite blogs,from Go2Web2.0, just put up a super blog entry sharing 39 free, no registration, no download web applications. These include a spell checker that works in any program, many photo editing applications and lots of other useful tools. Check it out. Adapted Musical Instruments at West Music Co. The Smart Talk is a learning device designed for ESL/ELL students. Basically you put a photo card into the Smart Talk and each of the three buttons lights up one at a time to guide you through hearing the word, hearing the definition of the word and hearing the function of the word. My class received a Smart Talk as part of a Donors Choose grant focusing on vocabulary development. I thought the Smart Talk would be fun and very educational for some of my students who need lots of vocabulary development. I was surprised to learn its application when beyond that. The addition of the function of the word when you press the button is great for one of my students who is working on both putting words into sentences and understand broader definitions of words, like category and function. Something none of the press tells you about the Smart Talk which is also great is that on the reverse of each card is a smaller version of the same picture and the text of what each of the buttons says. My one student who is a second grade level reader loves reading the words on the card as the Smart Talk reads it. At the other end of the spectrum, one of my student even enjoys the Smart Talk for the cause and effect value of just pressing the buttons and hearing the speech. Along with the Smart Talk we received all three boxes of photo cards, which is fantastic. The come in sturdy boxes, already divided into categories and color coded. My student who loves to tear paper was unable to rip the card he managed to hide away after using the Smart Talk to attempt o destroy later. He did manage to wrinkle it up pretty well. I would love to see the makers of Smart Talk, or a company like Enabling Devices or Ablenet, adapt the Smart Talk and add switch jacks to each of the buttons and/or an option of scanning the three buttons with a single switch. Of course if you or someone you know has the skills you could do at the very least the addition of the three switch jacks yourself. 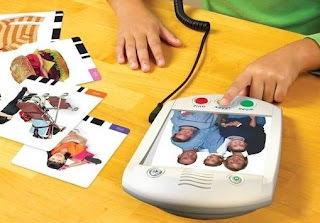 However a you could use the Linda Burkhart method of adapting a talking picture frame to make the smart talk more accessible by placing the bottom of the Smart Talk in a binder with a rubber bumper opposite the button you want pressed. All that being said if you do make (or have some else make) the Smart Talk switch accessible you would still need a buddy to change the cards, perhaps when the Smart Talk user presses a voice output switch asking for the card to be changed. That could be fun. My new 2008 Boardmaker Symbol addendum arrived yesterday in the mail from Mayer-Johnson. The disc contains 1,300 more symbols for your Boardmaker, Boardmaker Plus, or Boardmaker with SDP software. Many of the new symbols are related to math and science or transition to adulthood/post-high school placement. The cost is $29 dollars (US) and it installed like a breeze on my Windows XP laptop, in spite of having almost no memory available. If you need to buy all of the addendums the new 2000-2008 addendum bundle is $125.00. Even with all of the addendums and downloading the free monthly symbols there are some symbols I wish I had, that I think are not unique to my classroom. I submitted these suggestions for new or revised symbols to Mayer-Johnson today. I have submitted symbols before. Sometimes you get an e-mail a few weeks to a few months later with all or some of the symbols you request as an attachment (a few times I never heard back after requesting symbols). Don't forget that you can share any boards you make on the very active Yahoo Boardmaker Group or the (very inactive) Mayer-Johnson Sharing Page. 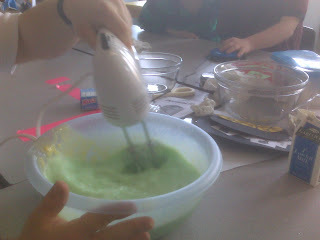 Today we made green and gold pudding in celebration of St. Patrick's Day (we like to get the party started early in our room). 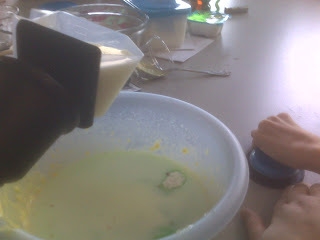 Here are some of my students making the pudding; differentiated instruction combines with assistive technology meaning everyone participates and learns independence. For technology we used our Enabling Devices pouring cup with a "jelly bean" switch, some standard electric beaters with our Ablenet powerlink and an Ablenet "big red" switch. The students did 99% of the work them selves, with more able students handling the beaters, opening boxes, etc. 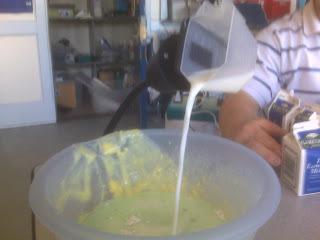 and switch users doing the pouring (via the switch pouring cup) and powering the beaters via switch for their friend. 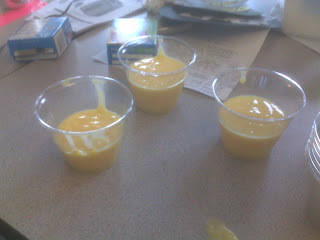 The end result was four cups of gold pudding (vanilla), four cups of green pudding (pistachio), a bit of a mess and a good time. A link to a fantastic hand out on partner assisted scanning was shared on the QIAT listserv today. The hand out offers ten tips for partner assisted scanning and explains each. I plan to go over this handout at my daily staff meeting tomorrow morning. Below are the ten tips, click here to download the PDF of the hand out. I would only add a reminder to allow enough wait time for the student to process and respond. Linda Burkhart also has two excellent handouts on partner assisted scanning, one that is an introduction and one that is from a presentation at ISAAC. ITC Fusion is a wiki that focuses on teaching life skills while teaching the state mandated curriculum. It has some nice Boardmaker boards and other resources. ATEN Region 3 Village is a wiki about creating thematic visuals and accessible literacy activities. Ohio Alternative Assessment has great information for all of working to do alt assessment or teach to state or local standards. I am also beginning to work on an intensive special needs wiki, but it will most likely be a summer project. It is located at Intensive SPED Resources if you want to check my progress. I did a favor for a fellow a teacher who works in another school district today. She teaches a PDD class grades 1-4 and has a 4th grader who is ready to move on next year. The student in question doesn't really belong in a PDD room, but that is another story. She didn't start using AAC until this year when I let her teacher borrow a 32 message 6 level device from my personal collection, as the school district had no interest in providing her with a device. Basically I met with the mom of the student and taught her about AAC, displayed three different dynamic display devices and taught her what to say to get an evaluation and a rental in order for her daughter to have a dynamic display device in the relativity near future. Basically I just told her that her daughter (and all children) are entitled to have assistive technology be considered as part of their IEPs. Nothing earth-shattering there, just the law. I explained that the district must supply the technology if it is educational necessary, but that she could negotiate for them to just pay for the evaluation and the rental of a device to collect data and then have state insurance pay for the device so that her daughter owned it, which has the bonus of making her look like a hero. In the end this mom said to me, "I know she has things to say. I know she wants to tell us things. I know there are things like what you are showing me out there for her. I just don't know who to ask." It brings tears to my eyes. This mom knows her daughter, knows she can communicate. We, all of us who are part of the system, have failed. The system that prepares educators, special educators, speech therapists and occupational therapists has failed. The system that placed this child in a PDD room failed. The system that created a situation that forced a classroom teacher to have to go to an out of district teacher-friend for a "favor" of educating a mom on her daughter's rights definitely failed. Those in the medical fields failed, why haven't they given this mom the information, sent the daughter for AAC eval? The device creators and vendors failed, why aren't they finding ways to connect with these desperate parents outside of school districts? Somehow, we, the stakeholders, the moms and dads, and people with disabilities who have found a way through these hurdles themselves and teachers and speech therapists, and device makers, and OTs and PTs, and AT specialists, all of us, we need to do a better job finding a way to give all students their voices and their power. • Give steps in formula for finding volume, surface area, etc. * These devices offer randomizing options.